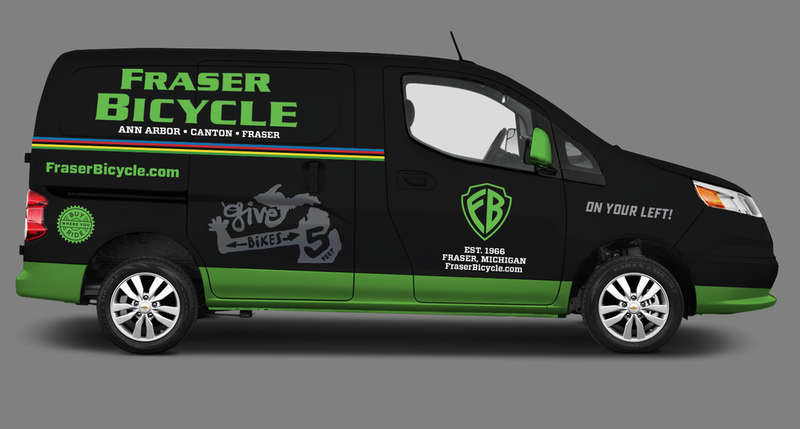 Fraser Bicycle is a metro Detroit bike shop with multiple locations, including their original shop in Fraser, Michigan. They now have a billboard on wheels to travel over our legendary Michigan pothole-filled roads between all of their locations and to various cycling events. 100% Design from Concept to Implementation, working directly with bike shop owner and vinyl graphics installer. My "Give Bikes 5 Feet" illustration was a perfect fit to add character to the minivan-esque sliding doors.